﻿ A Typical Tour of biking with Provence Cycling Holidays, self guided bike tours in the Luberon, Provence, France. A TYPICAL TOUR AT THE VILLA. 1 - This first example has a smaller amount of bike time with more of an emphasis on tourism. 2 - The second example is where the biking is more important, with greater distances covered (and of course lots of sights taken in). Note that most of us are somewhere in between these two examples. It's also important to remember that our self guided cycling tours are very flexible, meaning that these itineraries are by no way set in stone. These are guides as to what your tour could look like. On your arrival, by using our comprehensive Ride Directory (of 30 rides) and our input, we can easily put together the tour that is right for you, thus making the most of your time in Provence. 1 - A smaller amount of bike time with more of an accent on Tourism. Day 1: Arrival @ 4pm. - Visit the villa, bike fitting, GPS demo and a run through on how our tours work. And if you'd like we'll take you on a short 3kms ride to show you the GPS in action, and the nearby bike track. Then either a short ride or maybe a drink by the pool before dinner. Day 2 / Zone B. - What about an easy and quick ride or car journey to Coustellet for the best farmers' market in the area, with its amazing, fresh produce, it's a must, and a great place to fill up with produce for your visit. 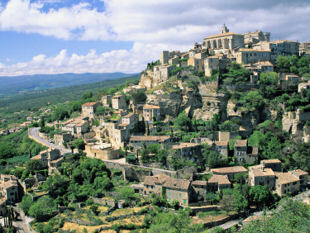 Then it's either back home or ride onto to the spectacular stone hill village of Gordes. There are many ways to get there, but you can rest assured that we'll take you the easiest	way. Take a seat at the cafe by the fountain & take in the view or wander around the village with its spectacular views. Visit the ancient stone settlement just outside Gordes. Then onto one of the many vineyards on the way home. 41kms / 25 miles. Day 3 / Zone A. 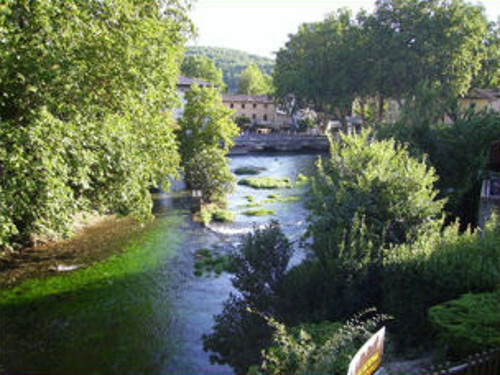 - Enjoy a gentle and flat ride visiting the beautiful riverside villages of Fontaine de Vaucluse & L'Isle sur la Sorgue. Admire the crystal clear water as you sit by one of the many riverside restaurants and cafes. L'Isle sur la Sorgue is the French Antiques capital - so dozens of shops to visit and a big market on the Sunday. Or just sit and enjoy an indulgent ice cream at one of the many parlours on the river's edge. 37 kms / 23 miles. Day 4 / Zone C. - Loads to look at here, as you visit Peter Mayle's Year in Provence territory, with a flat and rolling ride that takes in some beautiful landscapes and villages. Starting with a visit around Menerbes (where the book was written) then onto the unique and relatively unknown Oppede le Vieux, a beautiful village half destroyed by an earth quake. Enjoy a slow lunch on the small atmospheric square. Then back home via Maubec and Robion.30 kms / 18 miles. Day 5 / Zone E. - A lovely flat and rolling ride that stops at Goult, one of the Luberon's hidden gems. Enjoy a stroll through the lanes visiting the ancient dry stone buildings, the wind mill, the interesting old village, chateau and why not stop off and enjoy the ambiance at Le Cafe de la Poste for a great lunch. Then it's down to the lovely flat bike track and perhaps some wine tasting at one of the excellent vineyards. 41kms / 25 miles..
Day 6 / Zone D. - Why not take the ultra flat bike track to Apt, which crosses the ancient Roman bridge along way, and is also a great place for a picnic. Once in Apt, it has a very large, busy Saturday market which is worth immersing yourself in. Then it's either back home the easiest way via the track or it's up along the gentle gradient and through the stunning landscape to beautiful Bonnieux. It's definitely worth an exploration up through the tiny lanes and alleys to the top of the village, to arrive at the church and enjoy the magnificent vista down into the valley. More great lazy lunch spots or maybe one or two of the excellent vineyards for tasting on the way the home. Super flat 50 kms / 31 miles or a longer but still easy 60 kms / 37 miles. Day 7 - Departure after breakfast. 2. 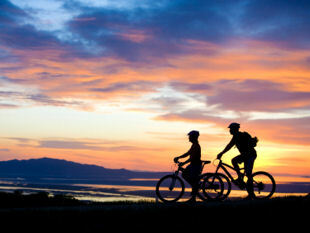 Where the biking is more important. Day 1: Arrival @ 4pm - Visit the villa, bike fitting, GPS demo and a run through on how our tours work. And if you'd like we'll take you on a short 3kms ride to show you the GPS in action, and the nearby bike track. Then either a short ride or maybe a drink by the pool before dinner. Day 2 / Zone B. - Two of France most beautiful vilages; Gordes & Roussillon and the hills above. Climb up to the famous village of Gordes and keep going into the quiet beautiful hills towards Murs, more great climbing then it's down to St Saturnin and to Roussillon in the Luberon valley, and the ochre mined landscape, both are great places for lunch. On through the lavender fields and down to the bike track home. 90 Kms / 56 Miles. Day 3 / Zone F. - Scenic tour around the Luberon Hills. Head off around the spectacular Luberon hills, through the riverside orchards to Merindol and over the many roller coasters to Lauris and pretty Lourmarin, which is definitely worth a lunch stop and a wander	around, as it's classified amongst France's most beautiful villages. 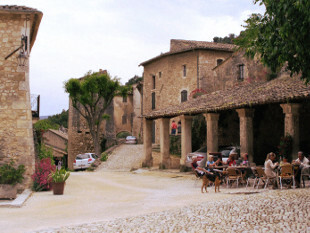 Leave up through the ravine road and tackle the 4km climb to Bonnieux, which is a beautiful stone village with great views into the Luberon valley. Then it's west along the valley home, via the vineyards with tasting available. 70 Kms / 44 Miles. Day 4 / Mont Ventoux. - Fancy tackling the Tour de France classic - Mont Ventoux? If so, drive the easy 50 mins journey to the official start point at Bedoin (carbon hire easily available). Start off the 21kms gently, with 3%, onto 5% then enjoy the 8-10% over the next 15kms. The last 6kms is well exposed so can be very windy - so choose your day well. Admire the 360 views and your time at the top. Then careful your brakes don't overheat on the long descent! It's not a huge distance - but it's a lot of altitude - 1600 metres gained from Bedoin or 1200 metres from Sault. If you enjoy it too much then you're not trying hard enough! Day 5 / Zones C & D. - A tour of the spectacular Luberon villages and landscape. 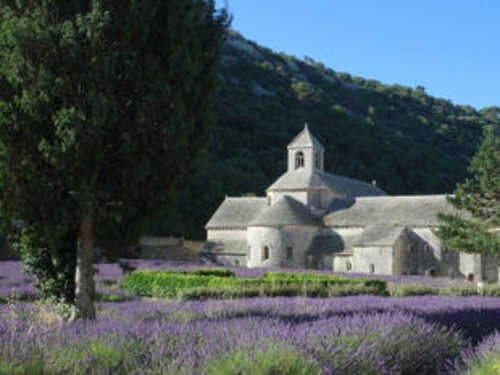 Take the rolling picturesque country bike route to the beautiful earthquaked village of Oppede Le Vieux and Menerbes, climb to Bonnieux and through the lavender plateau to Saignon - all four villages are well worth visiting. Down into the valley at Apt (renowned for its Sat morning market) and then it's along the bespoke flat bike track (tarmac) for 25kms all the way home, via Coustellet. 69 kms / 43 miles. Day 6 / Zone A. - Up into the hills. Take the scenic route to the unique river source village of Fontaine de Vaucluse, and into the quiet & beautiful hills behind and Venasque, with its superb views of Mt Ventoux. Down to picturesque St Didier for lunch, and then fast to L'Isle sur la Sorgue, with its pretty waterside views, restaurants, cafes and ice cream parlours. Back through the apple and peach orchards home. 68 Kms / 43 Miles. "Amazing system. Allows you to have a plan and know where you're going through small countryroads, villages, vineyards and orchards." Dana & Flynn - US - June 2010. 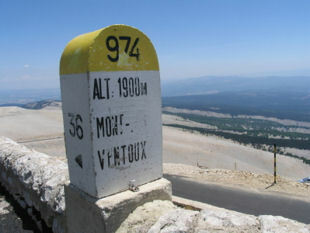 "if you want a route that sets you a bit of challenge with a good restaurant for lunch Neil will point you in the direction and recommend the best places to visit, And if you want the ultimate cycling challenge you can travel to Bedoin and then head up Mont Ventoux, an experience which will stay with you for some time to come!" Patrick - UK - June 2010. "you could take off for a ride at your own schedule, travel at your own speed and stop whenever you felt like it...which was often as there were so many spectacular photo opportunities." Donna - US - June 2010. Click HERE to read more about A Typical Day. Neil & Natalene COWELL - Provence Cycling Holidays - 65 Avenue du Moulin - 84300 Taillades - France.